We had some crazy weather in Batumi. The whole coastline was pounded with rain, thunderstorms and hail so we spent a lot of time in our hostel checking the forecasts online. We delayed leaving by a day, and were very glad we did. When we woke up on the 3rd, there was silence outside the window, no rain falling, and pulling the curtains, we saw the sky was a deep blue. 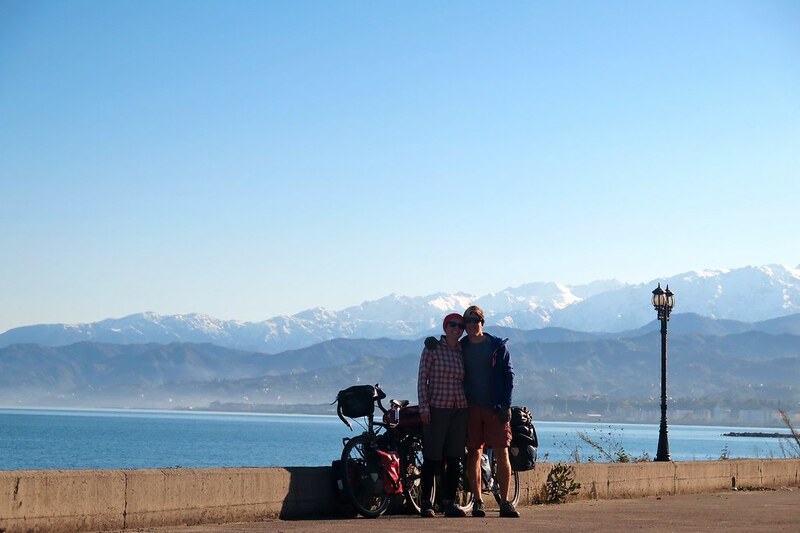 We packed up and hit the road, cycling through the city towards the sea front. 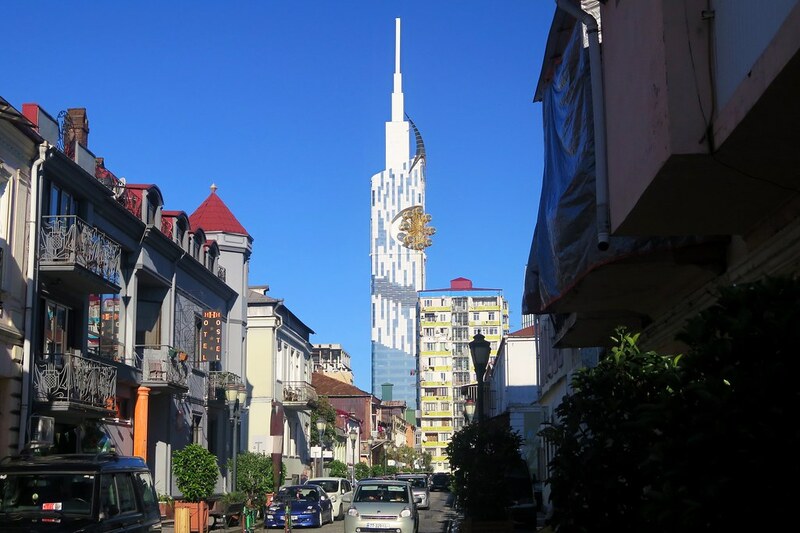 We liked Batumi anyway, even in the rain, but it was really lovely on a sunny morning. 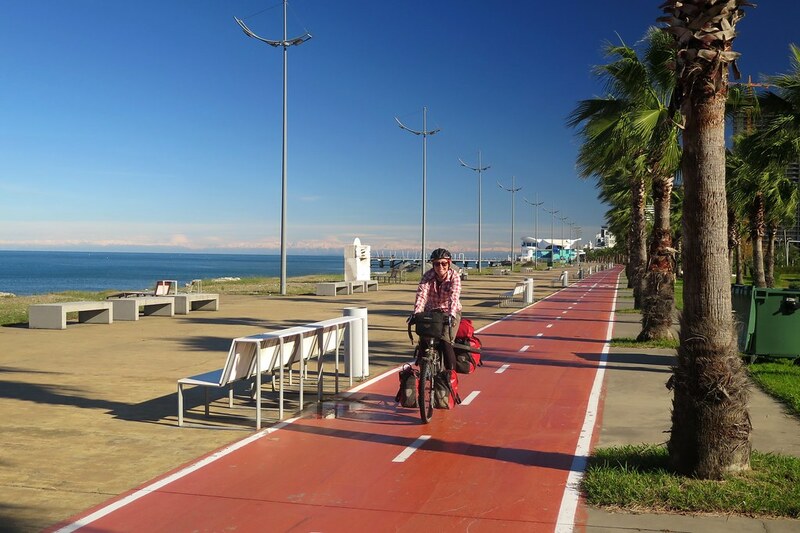 Once we got to the sea, we turned left and joined a perfect cycle lane which took us along the beach out of town. 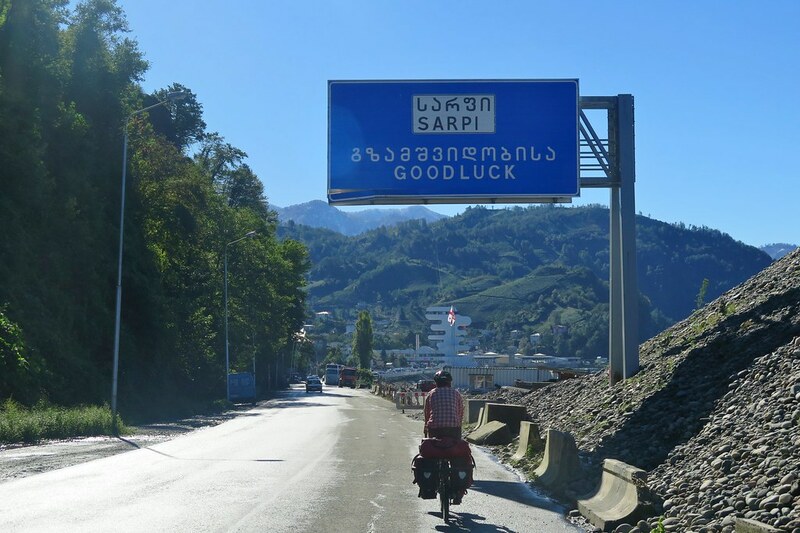 At the airport west of Batumi, we rejoined the main coast road for 15km or so to reach the Turkish border at Sarpi. We’d worked out this would be our last real land border crossing. We’ve crossed quite a few now and they can be quite tricky with a loaded bike as, usually, we’re sent through with the pedestrians. This time though, they sent us through the vehicle lane, skipping the queues. 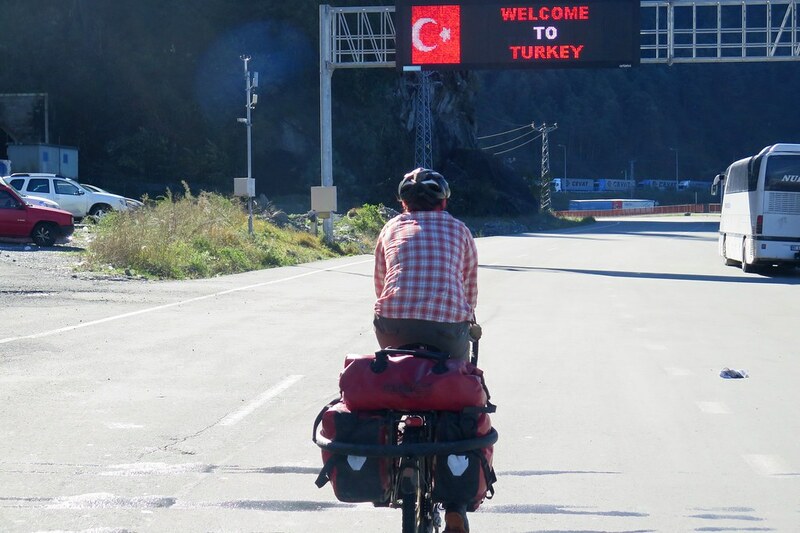 We’d arranged e-visas online, and were stamped through into Turkey within a couple of minutes, easy-peasy. Country number 15. 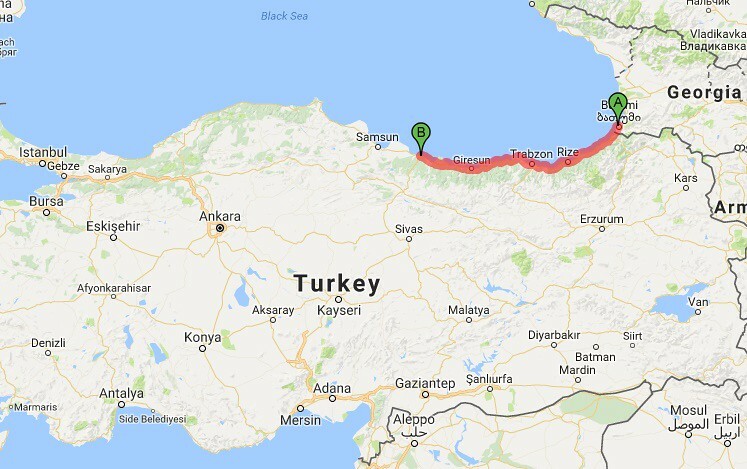 For our first few days in Turkey, we’d be following the main road along the Black Sea coast. We have heard mixed reports about this route, some say its really dull, some say it’s beautiful. I think it must depend on the weather at the time. 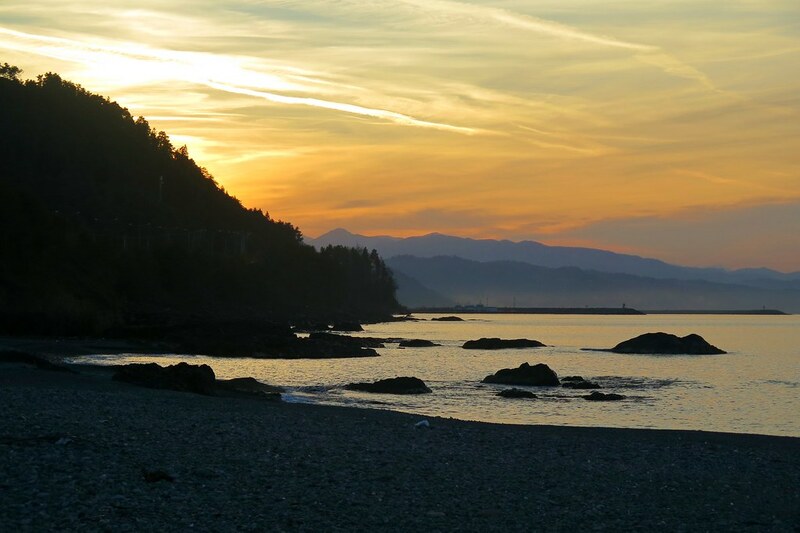 We had sunny weather most of the time, and agreed that it was indeed a beautiful stretch of coastline. 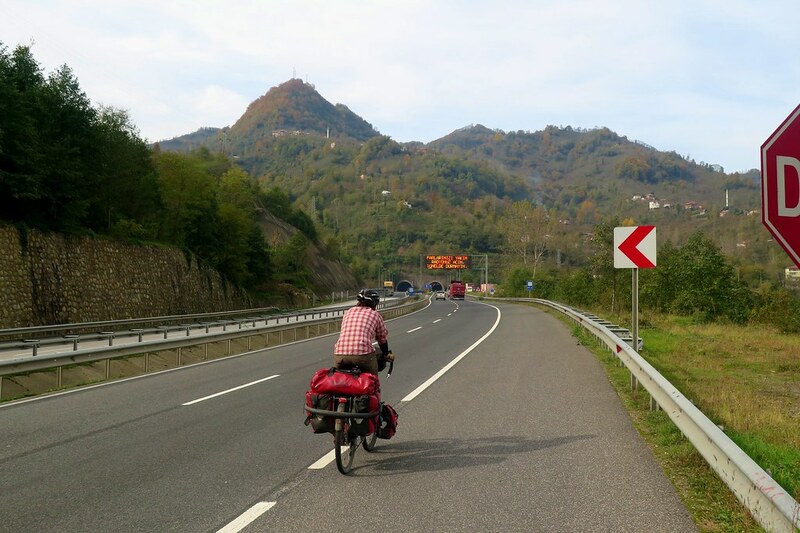 Admittedly, the riding was all on a motorway which detracts somewhat from the scenery, but we had a wide shoulder to ride on and the traffic was fairly quiet. It also helped that we were on the right, so had the sea next to us all the time, perfect for tea breaks sitting on the sea wall. Which is what we did soon after we crossed the border. 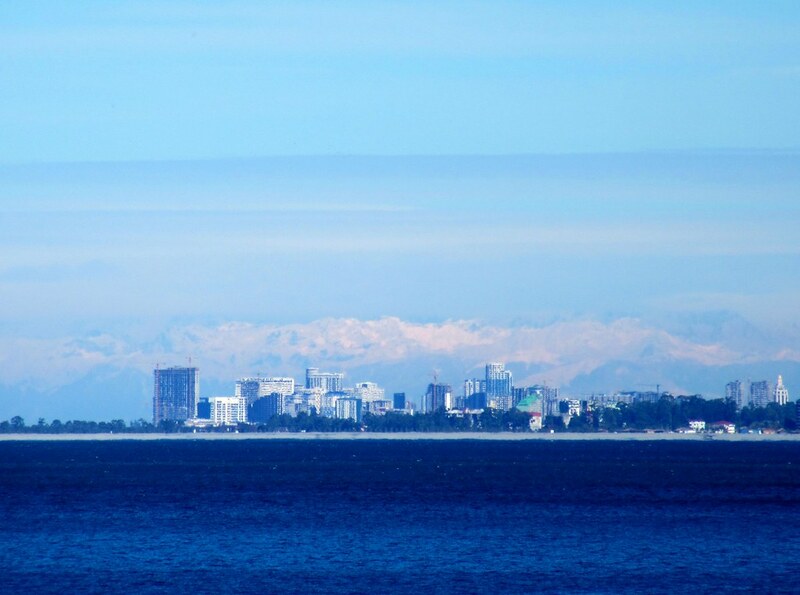 Looking back across the sea from where we’d come, we saw Batumi with snowy mountains behind. The heavy rain we’d had over the past few days must’ve been snow higher up, as all the mountains looked very well covered. A little while later, we passed another cyclist, Stanley, from Hong Kong. 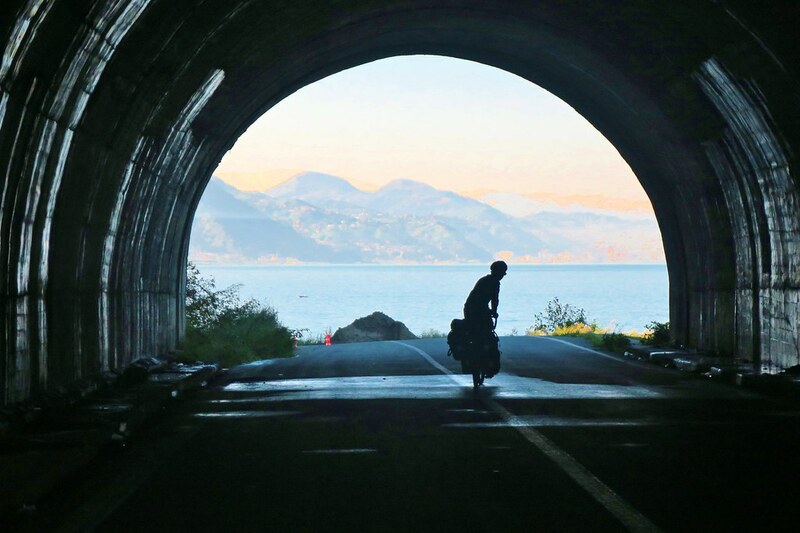 He’s cycled from London and is heading towards HK. He’s spent a long time in the UK, and even went to college in Worthing (where we live!) He’s planning to pass through Russia and Kazakhstan in mid-winter, brave lad. 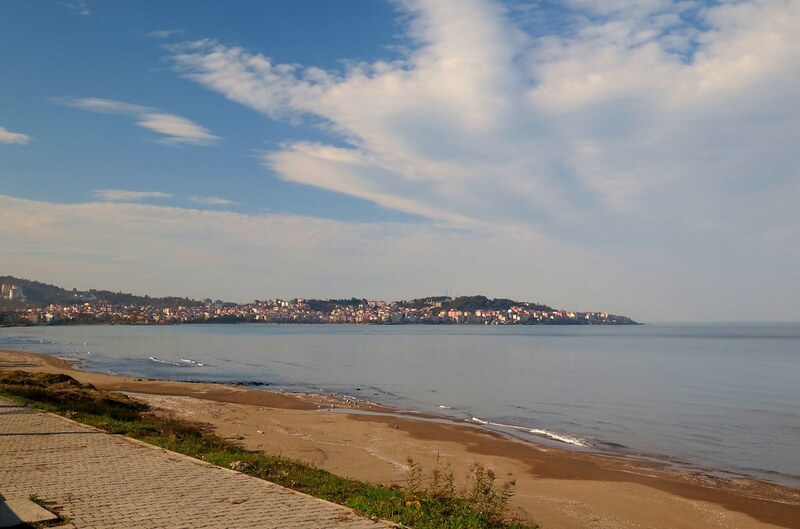 He followed the coast from Istanbul and said the weather had been terrible for him too. He’d resorted to camping in tunnels most nights to stay dry. 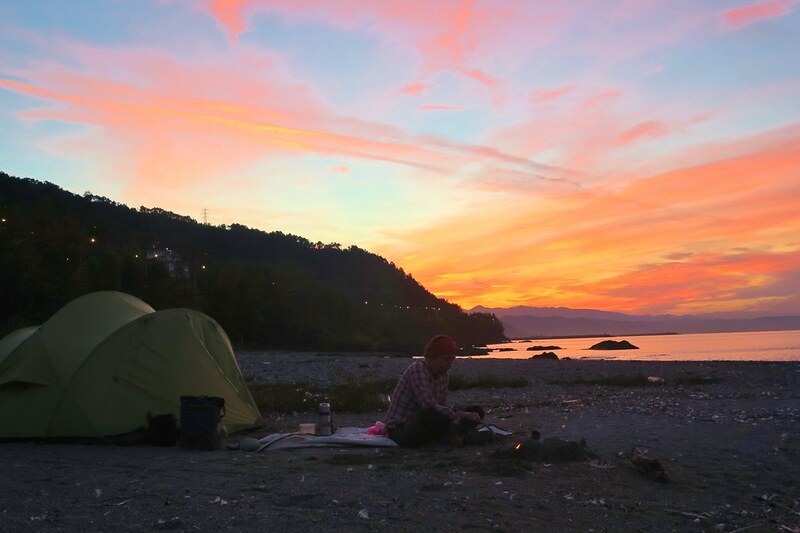 No problem for us that evening though, we found a flat spot on some rocks next to the sea and enjoyed the sunset. 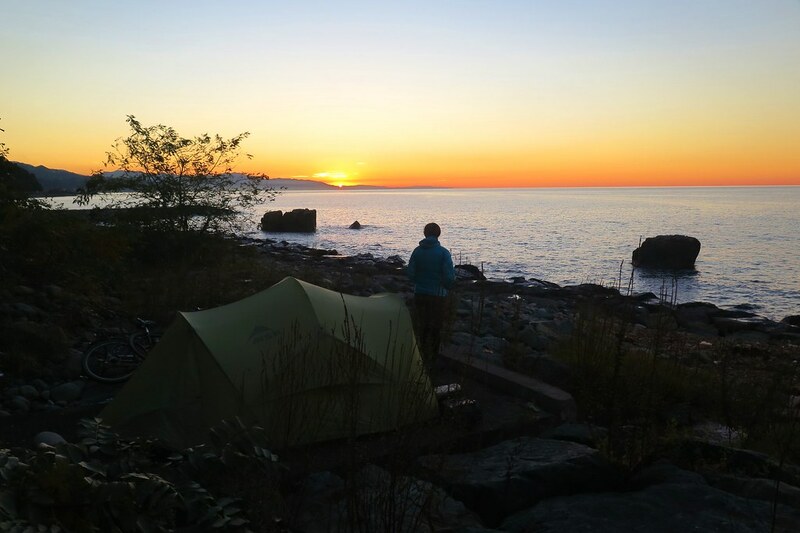 It’s chilly overnight and first thing in the morning with the clear skies, but we’re always warm enough in the tent. More beautiful views the next day, especially of the mountains inland to the south of us. The clear weather makes them look really close, and very tall. We’ll be heading that way in a few days time…. Hopefully the weather will stay clear! With the flat road and a slight tailwind, we’re able to put in decent distances without too much effort. 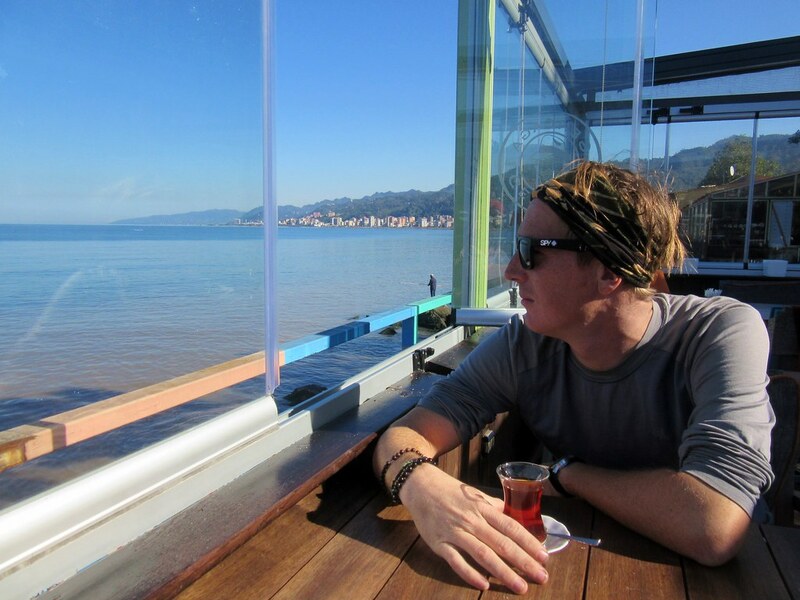 We stop for lunch that day at a beachside restaurant in Rize. After we’d ordered, the owners daughter came out to say hello to us. She was a keen cyclist and had spent four years studying in London. As we went to leave, she invited us to stay for more food with her family. Her father is a left wing journalist who’s been in jail a couple of times for his political views. 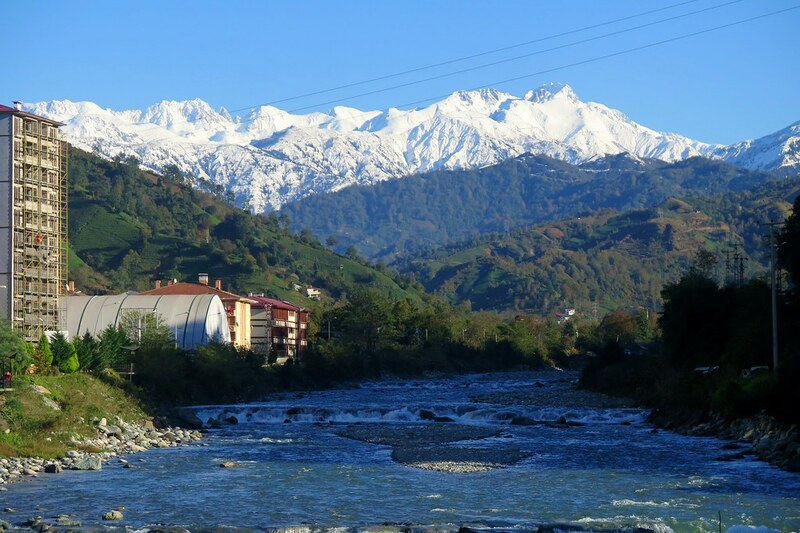 It turned out Rize is President Erdogan’s hometown and he has many supporters there. We’d read a little about the political situation in Turkey, but it was very interesting hearing more from locals who were very happy to speak freely. We hung around for longer than we expected over an extended lunch, so didn’t ride much more that afternoon. We got to a town called Of and stocked up on food and water, then looked for somewhere to camp. We didn’t look for long and soon found an empty beach. 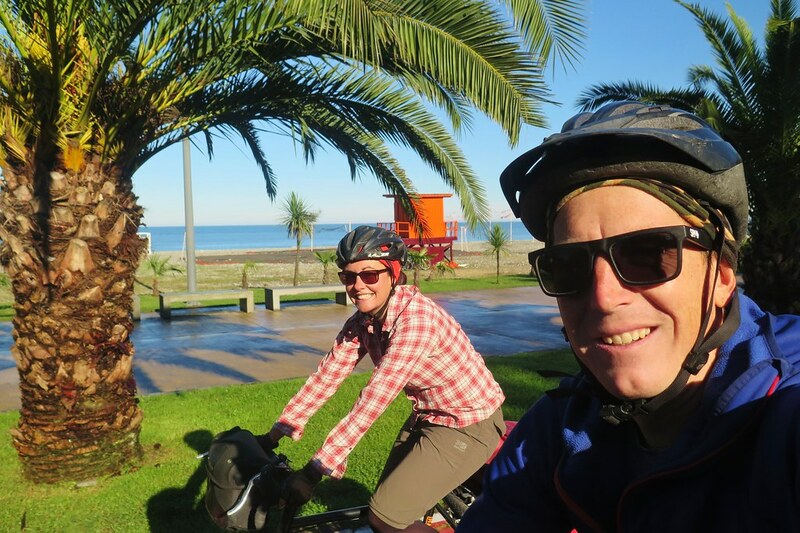 The advantage of cycling through a beachy area during the low-season! 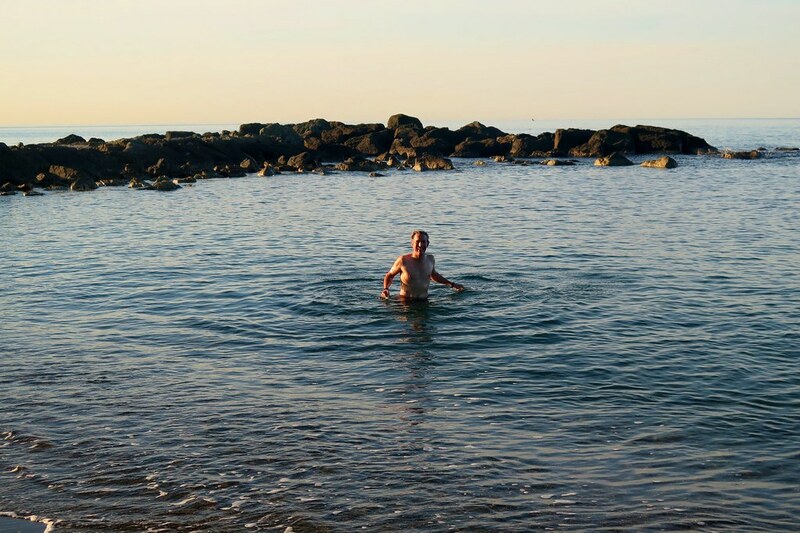 The sun was getting low in the sky but it was still warm, so I went for a quick swim. The water was a bit chilly, but much more comfortable than I expected. 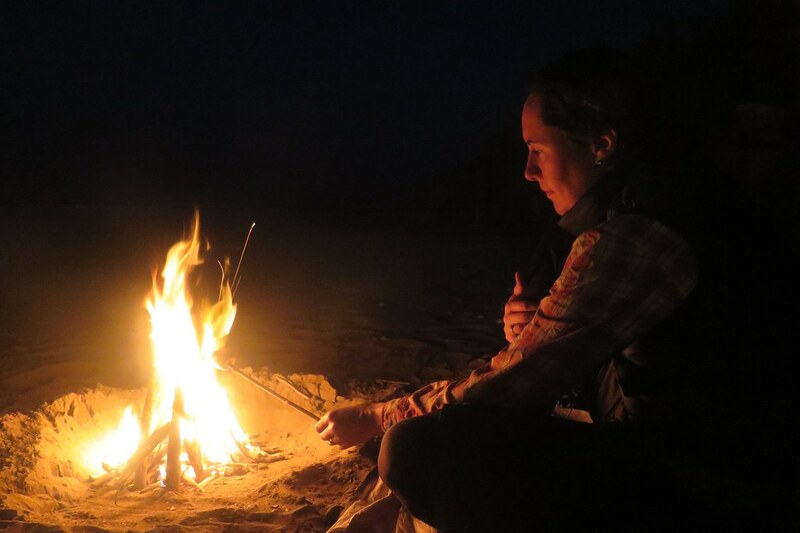 We got the tent up and had some dinner, then lit a fire with the driftwood on the beach. A good day. 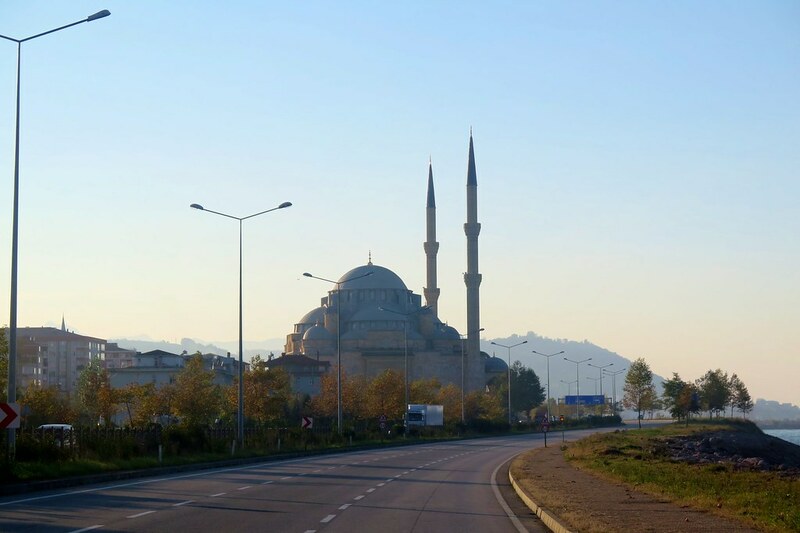 We had an early wake up call from the several mosques in town, whose morning calls to prayer echoed around at 6 o’clock. We packed up and were away quite quickly. The sky was a bit cloudier and the day was fairly uneventful. Heads down and get on with it. 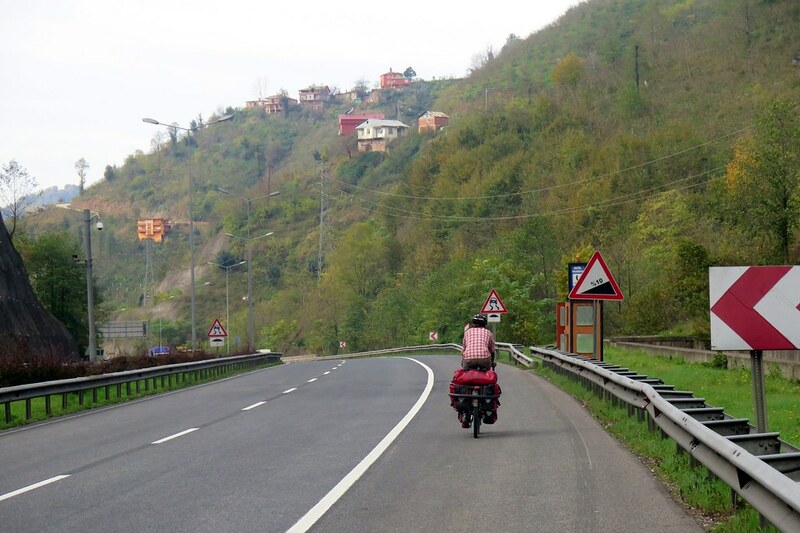 We spent a good couple of hours getting through Trabzon, one of the biggest cities along this coast. It was busy with roadworks, plus lots of stopping and starting at junctions. 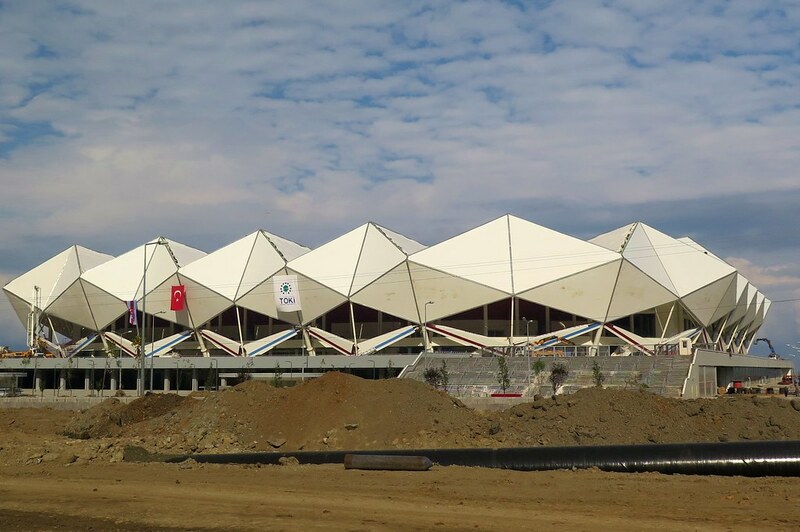 Eventually we were out the far side, riding past a brand new football stadium for Trabzon’s team, and the traffic started to get a bit calmer. We stopped for lunch, and for a moment we were transported back to China as we were invited to point at what we wanted to eat from ingredients in a big fridge. We went for some fish, and learnt a new word ‘balik.’ It came grilled, along with salad and bread, delicious. 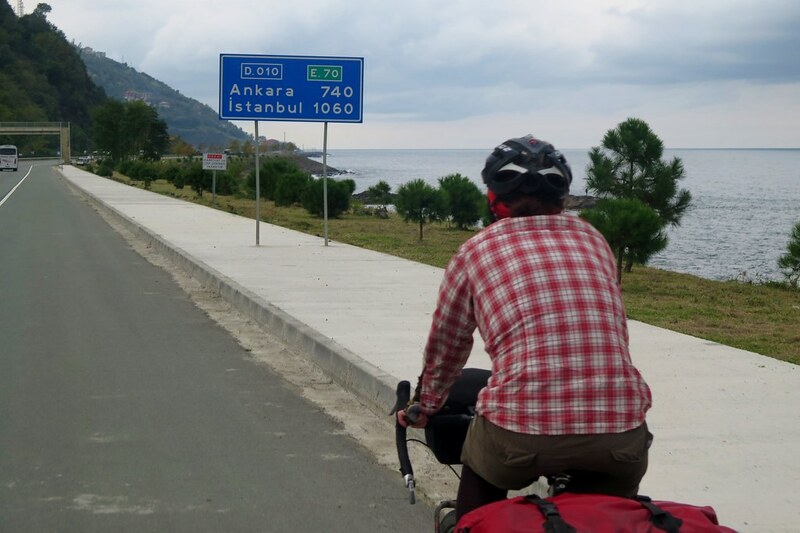 The afternoon was much like the morning, with a bit of a tailwind we just pushed on along the coast, passing signs to Ankara and Istanbul many hundreds of kilometers away. We stopped at a petrol station to get some fuel for the stove. Turkey is expensive! The petrol costs at least double what we’ve been paying up until now. Luckily we’re only buying a litre every few weeks! Everything seems to be more expensive here though, and with our weakened Pounds, we’re having to think a bit more about what we’re spending. 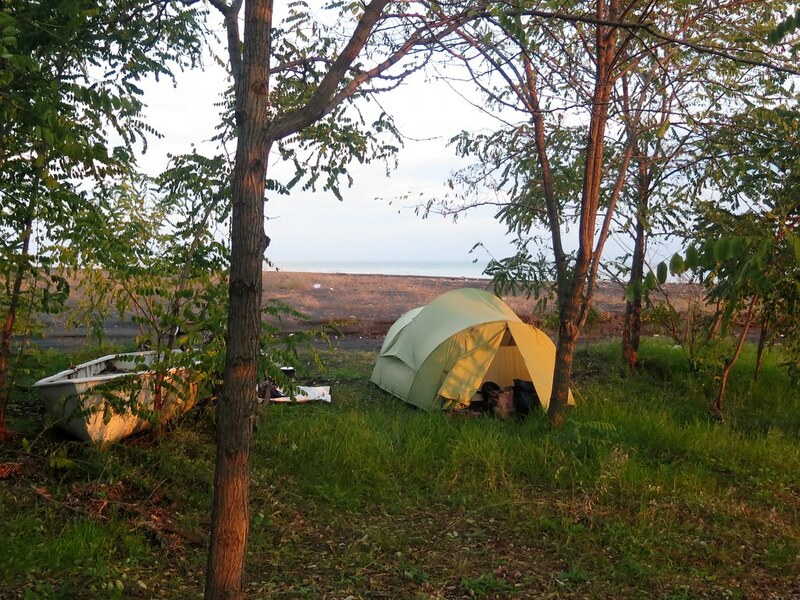 With the sky looking darker and a couple of drops of rain in the late afternoon, we got off the road and into a patch of trees next to the beach to set up camp. There are lots of beach huts which I imagine are used in the summer, but at the moment they’re empty, so could offer us some shelter if it did start raining. Luckily we didn’t need to use them. It was a sunny morning the next day and our tent was warmed by the early rays of the sun. Possibly because it was a Sunday, the roads seemed a lot quieter. We were able to ride side by side in the hard shoulder most of the time without feeling any danger from the passing traffic. 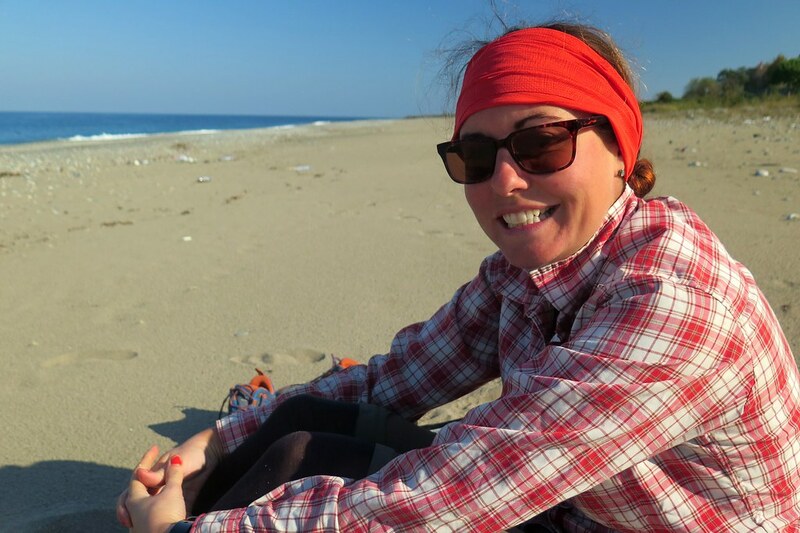 By mid morning the temperature had hit 20 degrees and we stopped on a wide sandy beach for tea and another swim. A lot of teenagers were out on the beaches, where it seems they go for the principal reason of taking selfies. 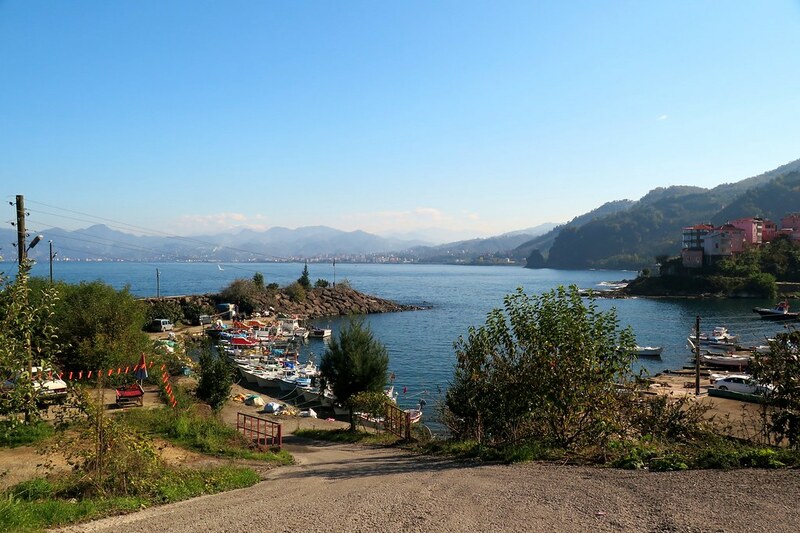 The towns we passed through were a lot smaller than Trabzon and some were really beautiful, stretching down the hillside to small harbours on the water. We stopped in one for lunch, another round of grilled fish. All the towns feel very developed, with well maintained and cared for public parks and facilities. There’s plenty of places for us to stop for a break or fill up our water bottles from water fountains. Typically, the biggest town we passed through, Bulancak, came just as we started looking for a place to camp for the night. 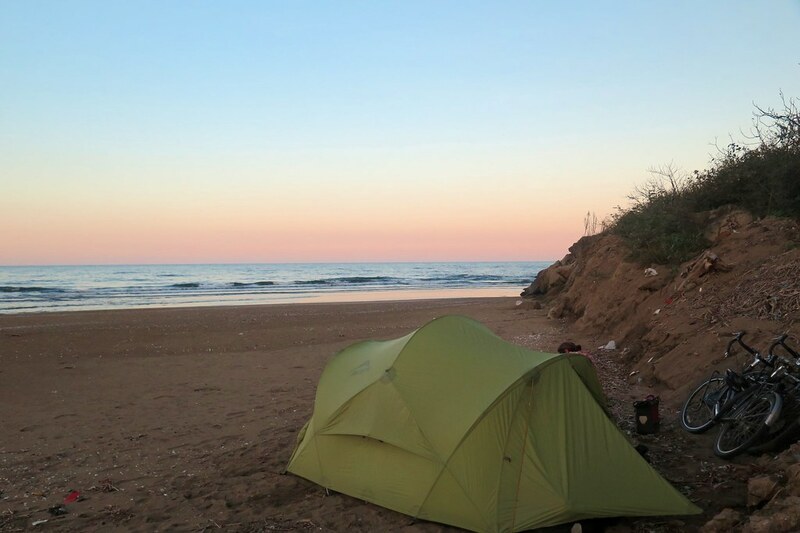 We eventually found a more secluded beach that wasn’t overlooked from the road so put the tent up there, even if it would mean an early wake up call from the nearby mosque. We made another fire, and toasted some marshmallows on it after dinner. 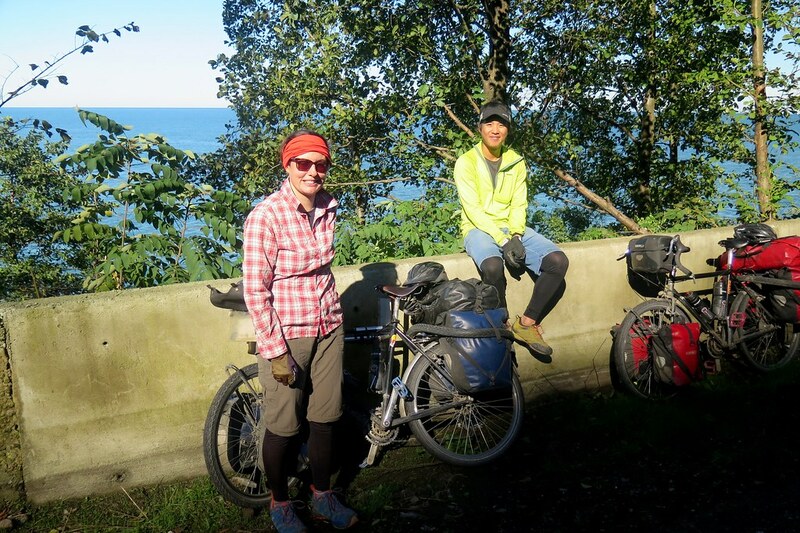 The next day, we had a choice of taking the longer, coastal road around a headland, or sticking on the motorway for a more direct route over some hills and through a tunnel. We wanted to get to Unye that day, which was 90km on the motorway or 110km on the coast road, so we opted for the shorter route. It was a long but quite mellow climb, the first we’ve had for a while. At the top, we had a series of tunnels. Subsequently we’ve read on a couple of blogs that these tunnels are dangerous and long, but we didn’t find them too bad at all. They’re well lit and the road surface is very smooth. For us, they were after the apex of the climb so we were able to coast through them quite quickly, even if the longest was almost 4km. Definitely worth it to shave off some distance, and for a nice long downhill on the far side back to sea level. Back at the coast, we had a quick lunch break, then pushed on for the remaining 30km to Unye. We’d camped every night so far (rare for us, I know!) so we’d decided to go for a hotel and a rest day. 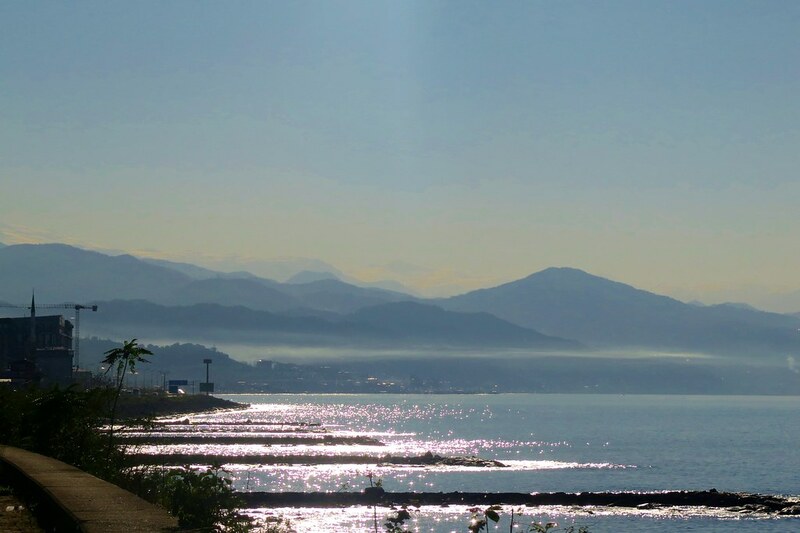 It’s another nice coastal town which in the summer time would be a bustling resort. After a bit of messing about finding somewhere, eventually we get a room, albeit very small and quite expensive. I guess we just have to get used to the fact that things will cost more the further west we go! Enjoyed reading your latest Andy & Claire. Lovely photos too. We rode that stretch in January and had some good weather and some bad. Enjoy the middle and keep warm!!! When you reach the Med things should get cheaper because there’ll be loads more choice and you can haggle hard…..